Buying a Retirement home or a second home can be a daunting task. Number of bedroom and bathrooms? Commute time, travel from home to the lake? Sandy beach? Yes of course. Southwest exposure for the perfect sunset! Private location or a community for your children? Seasonal lake cottage or a year round lake home ? Fishing ? What kind, trout, salmon or a warm water fishery. Snow skiing - how far do you want to be from a major resort? Do you want to boat, yes but motorboats or kayaks and canoes only? Shopping, where is the closest grocery store? What about cultural activities, museums, concerts and general fun stuff? What about the lake size, 100 acres or Lake Winnipesaukee with 42,000 acres? Price you want to spend on the home? With over 200 lakes to choose from you need a partner to help guide you along in the process. Your agent should have some general knowledge regarding the Shoreland Protection Act, wells, septics, setbacks, water quality, types of fish, boating restrictions, where the closest ski area and hiking trails are. If you have selected a lake and your budget puts you on that lake great, if you are like the many of the clients I encounter where your budget does not allow you to get a home on the lake of your choice and you do not want a water access home with a shared beach what's next. If your agent is diversified covering a large area he can suggest lakes you may have never heard of? Waukewan 900 acres - Merrymeeting Lake 1200 acres - Stinson Lake 300 acres - Lake Sunapee 4000 acres - Pleasant Lake, Deerfield or New London - Ossipee 3000 acres - Big Dan Hole Pond 408 acres - Highland Lake 700 acres - Great East Lake 1700 acres and not to forget Lake Winnipesaukee. Lady of the Lake Realty is a niche agency working only with buyers. We specialize in lake properties covering Lake Ossipee to Lake Sunapee and everything in-between. We will direct you quality lakes and have the answers to your questions regarding your dream home. Call us at 1-888-737-5550 or visit our website at www.nhlakesrealty.com where you will find listings to the lakes we recommend. 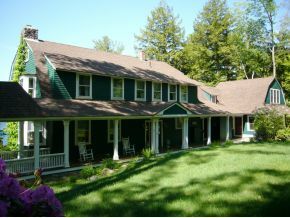 For additional information on NH lake homes call Lady of the Lake Realty at 1-888-737-5550 or e-mail at info@nhlakesrealty.com or visit our websites to view lake homes in New Hampshire at www.nhlakesrealty.com or www.lakeorskirealestate.com.